Each combatant belongs to a class (like mage or warrior), the class of the combatant can be changed during the game – either using the event system or through abilities or items. Classes are set up in Combatants > Classes. Like combatants, classes can (optionally) also level up. Like the combatant’s base level system, the class level also uses status development to give the status values of the combatant bonuses upon leveling up the class. When changing the class, it’s up to you if the classes development will be kept on the combatant or removed – this way you can have different status development bonuses when switching classes. The class defines what equipment parts the combatant has, and what weapons and armors can be equipped. You can learn more about the equipment system in this how-to. A class can have a class ability. It’s a special ability that will be available to the combatant while he belongs to the class. 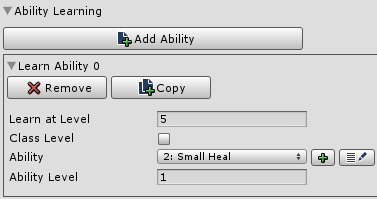 The class ability can be used through a special battle menu item. Furthermore, classes can have their own ability development – a combatant that belongs to the class will learn the abilities upon reaching the defined level (or class level). Like with the class level status development, the abilities can also be forgotten when changing the class. You can learn more about abilities in this how-to. Beside having it’s own status development when using class levels, classes can also give bonuses to selected status values. The bonus is given either as an absolute value (e.g. MaxHP +10) or as a percent of the current value (e.g. ATK +10%). 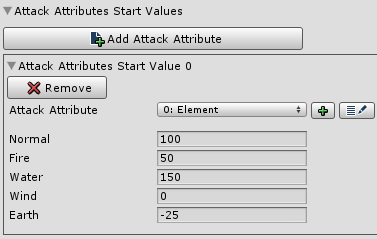 The class can override the default start values of attack and defence attributes and give bonuses to them. This way you can make a class vulnerable or resistant against certain attacks. 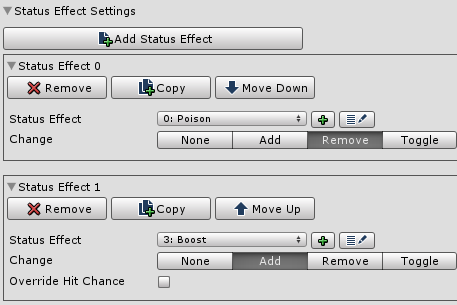 You can learn more about attributes in this how-to. Like equipment, classes can also give immunity to selected status effects or automatically apply them. Again, like equipment – a class can give a bonus to various chances (e.g. counter chance) and influence the combatant’s movement speed (walk, run, sprint). 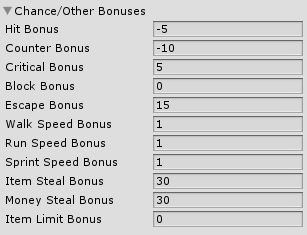 This way you can give obvious bonuses to a class – like increasing the steal chances of a Thief class.